There aren’t many furniture WordPress WooCommerce themes designed specifically for e-commerce websites selling furniture online. This is surprising given that nearly 2 million websites use WooCommerce, according to the latest WooCommerce stats for 2017. We’ve tried and tested some of the best WordPress WooCommerce themes and found some that are a great fit for furniture websites. Even better, all the themes featured below are fully responsive designs, so they’ll look great on mobile devices and different screen sizes. MayaShop is one of the most popular WordPress WooCommerce themes at the moment and is already used on over 5,000 websites worldwide. You can also use it with Jigoshop. It’s a sophisticated yet minimalist and modern design. There’s a wide range of background colours and textures, including several wood designs. This makes it ideal for furniture e-commerce websites. Click the pencil icon on the left to experiment with the theme options. The design is slightly feminine without being over the top, so I think MayaShop will work well for WordPress WooCommerce online shops that specialise in bespoke or handcrafted furniture. MayaShop is a particularly flexible WordPress WooCommerce theme. It has a huge choice of image slideshows and homepage layouts all integrated with WooCommerce, allowing you to showcase your furniture in the best possible way. 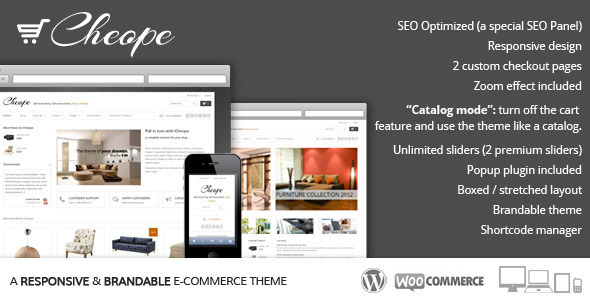 Cheope is another great responsive WordPress theme with styling for WooCommerce. Like MayaShop, it is sophisticated and modern, with a choice of background patterns including wooden patterns ideal for furniture websites. Cheope advertises itself as being fully brandable, allowing you to customise it to suit your business. It has a choice of 8 sliders and some nice extra features such as zoomable products, so it’s easy to use this WordPress WooCommerce theme to make your furniture website look great. The Impulse WordPress WooCommerce theme is much more minimalist than MayaShop and Cheope. 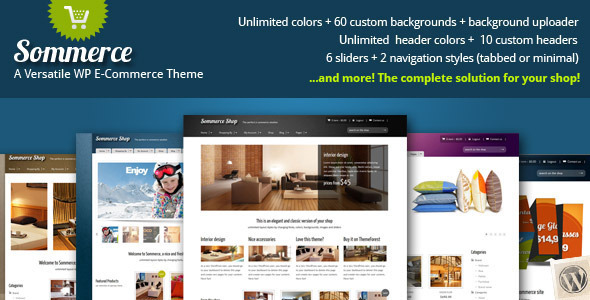 Released just one month ago, you can be one of the first e-commerce websites with this theme. With a big choice of background options and unlimited colour options, Impulse is very customisable and flexible. Impulse is a bold, masculine design and would work perfectly for sturdy furniture designs as well as rustic and modern furniture. Sommerce Shop is a more classic design than the other WordPress WooCommerce themes features here. Released in 2011, it is also slightly older although it’s still actively supported (at the time of writing, the last update was just 3 weeks ago) and is definitely worth considering. 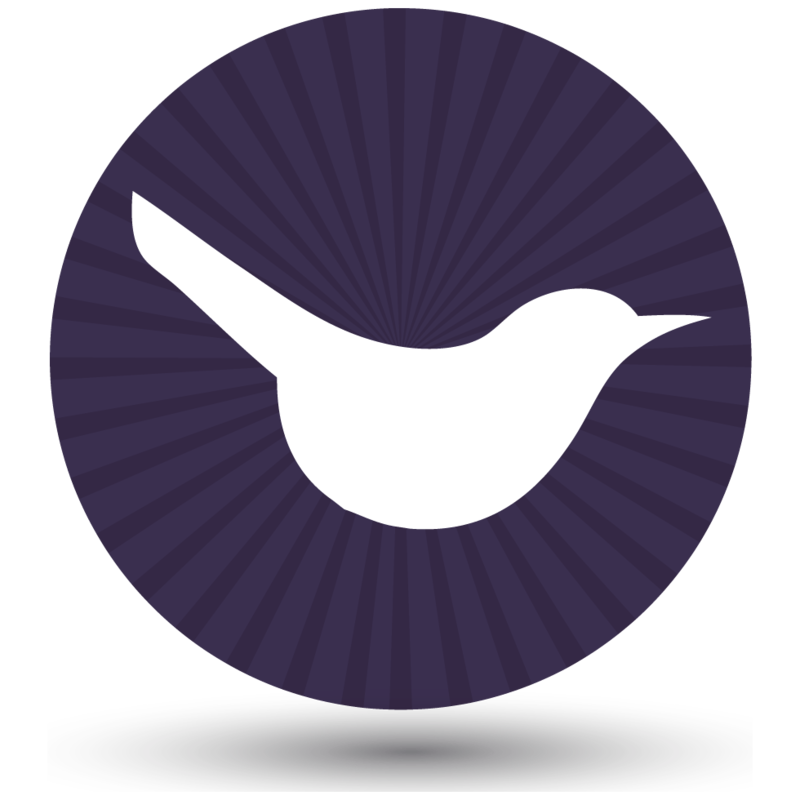 You can use it with either Jigoshop or WooCommerce. Sommerce Shop has a huge choice of layout options and skins, giving you full control over how to present your website content and products. The best WordPress WooCommerce theme for furniture websites? The above themes are all good, which is why I’ve featured them in this article. Overall, I would go for MayaShop due to its winning combination of stylish, modern design and its range of layouts and styling options. Wow! Thanks for this list! You've provided an AWESOME analysis of each themes showcased. Much appreciated! Thanks for your feedback Shade, I'm pleased the list was useful to you. Hi Sarah, I recommend that you look at the themes listed in the 'A brighter future for WordPress themes' section of a more recent post which I wrote: https://barn2.co.uk/wordpress-theme-arms-race. These are all good theme authors and they have lots of WordPress themes with sliders. Let me know if you need us to set up the overall website for you (we can provide a more formal shortlist of suitable themes as part of the project, as choosing the right theme is a big decision!). I am new in wordpress,, web design agencies like us we do responsive websites but its not simple, in wordpress everything is ready to apply, some of our customers websites do with this trechniue look them from www.medyator.net , thanks for sharing again .